With a little help from neighborhood friends, Waterbury Gardens is back in bloom. 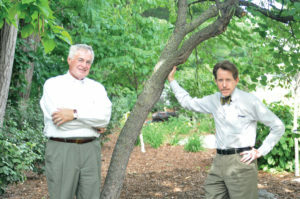 According to neighbors in the Waterbury area, Thomas McBride III (right) and Bill Scherle (left) deserve a pat on the back for their efforts revitalizing Waterbury Gardens. The project near the corner of Ingersoll Avenue and 48th Street was once a paved roadway. Then it became a garden. After that, unfortunately, it turned into an overgrown garden. “Time, dry summers, and harsh winters” took their toll, said a community newsletter. Fortunately, two Waterbury neighbors have joined forces and started reversing the process. 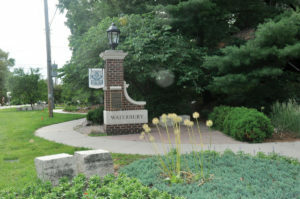 Scherle says the garden is important because it is the entryway to Waterbury. McBride adds that people walk through with their dogs and bring children on walks. They both agree that making it look nicer is rewarding. The duo has a combined 60 years in the neighborhood — they’ve been neighbors for 20. Neither is afraid to get their hands dirty, and both enjoy the satisfaction of a job well done. They aren’t certain of the exact timeline, but at some point in the past, someone put plans together for the garden. The city came in and helped plant the area, but over time, things die and get overgrown. Last spring a new plan was drawn up. McBride and Scherle have been in the process of executing that plan ever since. Removing brush turned out to be a big job. So did laying the mulch. “Really a lot of heavy lifting has been done,” says Scherle. McBride credits Scherle with coming up with a couple of helpful ideas. “There was a guy in the neighborhood that had all these boulders in his front yard,” he explains. “And he agreed to donate them to the neighborhood. So we had them loaded up, brought over here, and we had them spread out. Small trees and hostas have also been planted. More plantings are on the docket, and more berms will soon be installed along with the irrigation system that was paid for in part by a government grant. If all goes well, the garden plan will be entirely finished in another year or two. Will there be a party when it’s complete? “This is a job that never ends,” says Scherle. That may be, but with a little help from Waterbury friends, McBride and Scherle are making a difference.